LOS ANGELES (AP) — The first day of spring looked a lot like winter in Southern California, as yet another storm dumped heavy rain that flooded streets and briefly shut down highways. DALLAS (AP) — Severe thunderstorms in Texas have left at least one person hurt, damaged buildings and flipped small planes at suburban Dallas airport. MINNEAPOLIS (AP) — Another winter storm is bringing a little bit of everything to the Upper Midwest, including a chance of thunderstorms. Lee Hendrickson, a meteorologist with the National Weather Service in Pittsburgh, tells the Meadville Tribune weather spotters reported a funnel cloud during Tuesday's storm, but there were no reports of a touchdown. AUSTIN, Texas (AP) — Officials say an American Eagle flight from Mexico was diverted because of heavy storms in Texas and that some passengers requested medical attention after turbulence aboard the flight. Meteorologists in Arkansas have confirmed that at least three tornadoes developed from severe thunderstorms on Friday night. The National Weather Service said Sunday that a strong tornado touched down in Van Buren, Arkansas, about 130 miles (212 kilometers) northwest of Little Rock. The tornado was rated an EF2, which indicates wind speeds as high as 135 mph. TACOMA, Wash. (AP) — A strong thunderstorm dumped copious amounts of rain in the South Sound, leading to some urban flooding in Tacoma, Washington. Heavy downpours also drenched Portland, Oregon. KOMO-TV reports that a man got stranded in flood waters with his jeep in Tacoma. A good Samaritan pulled the stranded man's car out with rope. INDIANAPOLIS (AP) — A forecast of heavy rain and possibly a thunderstorm Wednesday night has some southern Indiana communities changing their Halloween trick-or-treating times. Those moving to Tuesday include New Albany and Floyd County, the Jefferson County towns of Clarksville, Charlestown, Sellersburg, Henryville, Utica, and Borden, and all of the communities in adjacent Washington County. FALMOUTH, Mass. (AP) — A band of powerful storms has rolled through parts of southern New England, touching off thunderstorms and prompting tornado warnings to be issued. There are no immediate reports of injuries or major damage from Monday's storms, and all warnings have now been lifted. The National Weather Service says the captain of a ferry leaving Martha's Vineyard observed a water spout shortly before 10 a.m.
LOS ANGELES (AP) — Thunderstorms put on a dazzling show in Southern California skies but left behind spotty power outages across the region. The belt of storms Friday and Saturday came with lashing rain, streaks of lightening, thunder and wind. Local utilities said Saturday as many as 18,000 customers were without power at some point, but much of that service has been restored. DALLAS (AP) — A construction worker is dead and five co-workers are hospitalized with injuries after a three-story town house they were building in Dallas collapsed during a thunderstorm. The collapse happened about 4 p.m. Monday about a mile (1.6 kilometers) west of the city's downtown. Dallas Fire-Rescue spokesman Jason Evans says 20 to 30 people were working in and around the wood-frame structure when it collapsed, trapping six workers. 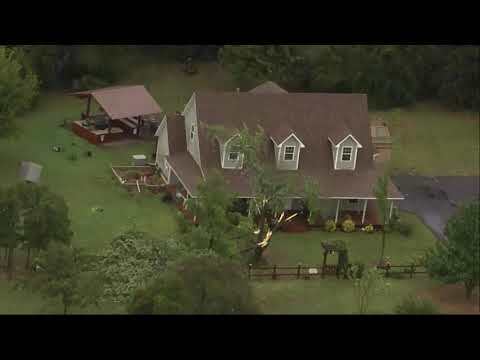 NEW CANAAN, Conn. (AP) — The National Weather Service says two tornados touched down in Connecticut earlier this week as a series of severe thunderstorms made their way across the state. The EF1 tornado with maximum wind speeds of 100 mph touched down in New Canaan at 5:29 p.m. Tuesday and lasted about 12 minutes, cutting a nearly four-mile path to Norwalk. It was about 100 yards wide. The weather service says no fatalities or injuries were reported but there was damage to trees and cars. HAMDEN, Conn. (AP) — Officials say they suspect a fierce thunderstorm that rolled through Connecticut this week is believed to be the cause of a house fire in Hamden. Hamden fire crews responded to an apartment complex late Tuesday due to multiple reports of a lightning strike. Firefighters found the roof smoldering and charred in places. LINCOLN, Neb. (AP) — University of Nebraska researchers plan to use drones and other equipment to conduct a study on tornadoes and thunderstorms that aims to improve weather forecasts. The researchers are helping lead the study with more than 50 scientists and students from the University of Colorado, Texas Tech University and the University of Oklahoma. COLCHESTER, Vt. (AP) — Vermont utilities are warning residents about possible power outages from thunderstorms expected to hit the state. Green Mountain Power, the state's largest utility, says crews are prepared to respond if power is knocked out by the band of storms with heavy winds that are forecast to pass through the state Wednesday afternoon. CHICAGO (AP) — Severe thunderstorms that swept the Chicago area toppled trees and power lines, cutting cut power to thousands of residents. ComEd says more than 30,000 homes and businesses, mostly in Chicago's west suburbs, were without power as of 9 p.m. Tuesday after the storms brought winds in excess of 60 mph (96 kilometers per hour). Power was restored to all but about ComEd 7,000 customers by Wednesday morning. OMAHA, Neb. (AP) — The lightning delays and eventual cancellation of the University of Nebraska-Akron football game demonstrates how schools can detect or respond to dangerous thunderstorms. A series of thunderstorms packing gusts approaching 70 mph have caused extensive damage and left thousands without electricity in Maine. Central Maine Power reported more than 24,000 homes and businesses were in the dark Thursday afternoon as storms moved across the state. MADISON, Wis. (AP) — Showers and thunderstorms continue to increase already swollen rivers and make travel around flooded areas difficult in southern Wisconsin. Madison is bracing for flash flooding as Lake Monona reached a record level of 7.5 inches (19 centimeters) above the 100-year flood elevation. SANTA FE, N.M. (AP) — An organizer is promising refunds to about 2,000 people who were still in line when gates closed early for an annual Zozobra effigy burning ceremony marking the start of the Fiestas de Santa Fe. ELKHART, Ind. (AP) — Dozens of workers hunkered down and escaped serious injury when a severe thunderstorm's winds ripped through an industrial plant in northern Indiana. Wednesday's storm that swept the northwest side of the city of Elkhart caused significant damage to an AACOA plant that's a division of Bonnell Aluminum. DAVENPORT, Iowa (AP) — Powerful winds from thunderstorms have knocked down trees and power lines and damaged buildings in eastern Iowa. No injuries have been reported from Tuesday's storming. The National Weather Service says a tornado was reported around 7:10 p.m. in a rural area near Grand Mound. A wind gust of 83 mph (134 kph) was reported at Iowa City Municipal Airport, and gusts over 60 mph (97 kph) were reported in several spots. Several trees were downed in Parnell. MUSKEGON, Mich. (AP) — Thunderstorms with strong winds and heavy rain pounded western Michigan, causing thousands of power outages and some road flooding. The National Weather Service says wind gusts reached nearly 70 mph Sunday night near Muskegon, where 5 inches of rainfall was reported in places. The Grand Rapids area also saw up to 3 inches of rain. SPRINGFIELD, Ill. (AP) — Heavy rain caused the cancellation of an outdoor concert at the Illinois State Fair Grandstand and some flooding at the fairgrounds. Thunderstorms dumped up to 2 inches of rain in the Springfield area Thursday night as some 8,000 fans were at the fairgrounds grandstand for a concert by country singer Thomas Rhett. MUNCIE, Ind. (AP) — A central Indiana fieldhouse that's one of the nation's largest high school basketball venues is set for emergency repairs nine months after a severe thunderstorm ripped a hole in its roof and ruptured water lines that flooded its hardwood basketball court. BREWSTER, Mass. (AP) — Powerful thunderstorms have caused thousands of power outages and at least two house fires on Cape Cod. Eversource officials say up to 3,700 homes and businesses in the region lost electricity Thursday morning as trees and utility lines came down. About 700 outages remained late in the afternoon. BANGOR, Maine (AP) — A fast-moving line of severe thunderstorms knocked out power to about 2,000 homes and businesses in Penobscot County, sending utility crews scrambling. Bangor officials said strong winds and heavy rain wreaked havoc Thursday afternoon, knocking down trees and flooding low-lying roads. At the peak, about 1,500 Emera Maine and 700 Central Maine Power customers were in the dark. But the numbers dropped rapidly. EL MIRAGE, Ariz. (AP) — Authorities say two teens were seriously injured when struck by lightning while playing in an El Mirage park Wednesday night as thunderstorms pummeled metro Phoenix with rain and strong winds. DETROIT (AP) — A cleanup effort is taking place on Detroit's Belle Isle after severe thunderstorms this week damaged or knocked down scores of trees. The island park in the Detroit River was among the hard-hit areas following Monday's storms, which caused damage and knocked out power on Detroit's east side, the Grosse Pointe suburbs and elsewhere. No injuries were reported. NORTH PLATTE, Neb. (AP) — The National Weather Service says thunderstorms that pounded western Nebraska with hail left a faint trail of damage detectable from a satellite. A northwest-to-southeast line across the Panhandle can be seen from more than 22,000 miles above the Earth. The weather service office in North Platte posted the Monday evening satellite images on its Facebook page . Utility crews are restoring power to hundreds of homes and businesses that lost power during severe thunderstorms in Maine. Powerful thunderstorms swept across parts of the state in the late afternoon and evening on Tuesday, knocking down trees and electrical wires. CMP said more than 1,500 homes and businesses remained without power Wednesday morning. Tree damage, lightning strikes, and some power outages also were reported in part of New Hampshire.